Does your child understand what you say to them? Can they follow instructions in school or nursery? Can you ask them to do more than one thing e.g. go upstairs, brush your teeth and get your school bag? Children need to understand what is said to them before they can start using words and sentences accurately. Following instructions is a vital skill for learning and keeping safe. Children who have difficulties understanding can be labelled as naughty but it could be that they don’t know what they are supposed to be doing. Some instructions are easy to follow e.g. go get your shoes- your child may know that before they go out they need their shoes; they will have done this many times and can see the other people around them putting their shoes on. As they get older, children are expected to follow longer, more complex instructions e.g. Put your books in the red box, wash your hands then sit down on the carpet. They need to remember lots of information, know the vocabulary used (box, wash, hands, red) and understand the smaller grammatical words (in, then). 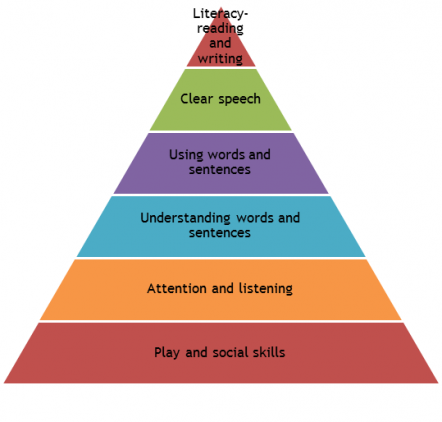 Speech and Language Therapists are highly skilled at assessing comprehension (understanding language) and highlighting where any problems may lie. Does your child find it hard to sit still? Do they appear to ignore you? Do they talk when they should be listening? Do they have difficulty following instructions? Can they only concentrate on one thing at a time? Do they move quickly from one toy to another? Do they find it very hard to complete a game or activity? 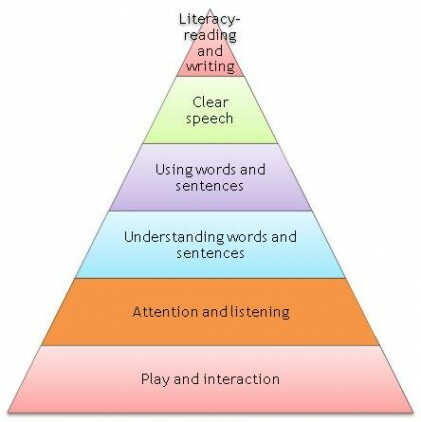 Lots of children have difficulties with their attention (concentration) and listening skills. Children’s attention develops and matures as they get older. Children with attention and listening difficulties often end up in trouble in school or nursery. They are not being naughty; they need someone to help develop their attention and listening skills. Successful communication is made up of many components. Language can develop naturally for lots of children, however for around 1 in 10 children extra support is needed to help them become confident communicators. 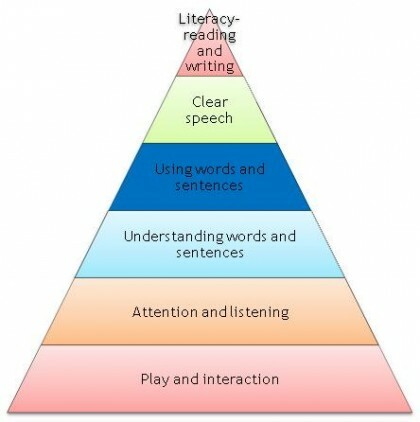 Language can be thought of as a pyramid, each layer needs to be securely in place to support the next block. Without a good solid base, further development can be shaky. Children can have difficulties at each level and specialist input is needed to provide the correct support. Over the coming weeks we will explain each layer in more detail and what you can do to help your child become a confident happy communicator.